This game is sometimes written as Gokujō Parodius! ～Kako no Eikō o Motomete～; this is how it is written on Wikiepedia. 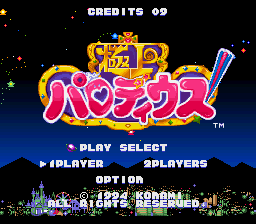 Translated literally it becomes Fantastic Parodius! ～Pursue the Glory of the Past～. It was also released in Europe under the name of Fantastic Journey.